: Soluble in alcohol and oils. 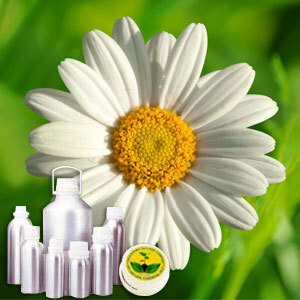 Chamomile is one of the most famous of the daisy family of plants. This essential oil is extracted from the leaves and flower cones by steam distillation method. It is light green-blue to cobalt blue in color having aroma similar to that of a mixture of apples and newly cut grass. chamazulene, a-bisabolol, bisabolol oxide A, bisabolol oxide B and bisabolone oxide A. Other constituents include a volatile oil, anthemic acid, antheminidine, tannin, matricarin, and apigenin. A medium middle note, Chamomile Oil has a soft, woody fragrance similar to that of Moroccan Chamomile, with a haunting bittersweet note. The Therapeutic Grade chamomile oil blends well with bergamot, clary sage, lavender, geranium, jasmine, tea tree, grapefruit, rose, lemon and ylang-ylang. This oil has antiseptic properties and thereby used in various natural skin care products as a skin decongestant and cleanser. Due to its antibacterial, antifungal and antiviral properties, this essential oil is often used in creams or ointments to soothe irritated skin. It is also proved that it may be moderately effective in the treatment of eczema. Therapeutic Grade Chamomile Oil recommended due to its various therapeutic properties which include - analgesic, antidepressant, antispasmodic, anti-venomous, carminative, digestive, emmenagogue, expectorant, febrifuge, insecticide, stomachic, tonic and stimulant.